As cataract surgery becomes more well known to our aging human population, it’s equally common for aging animals. So much so, that there is a team of specialists who travel the world to perform cataract surgery on pinnipeds. 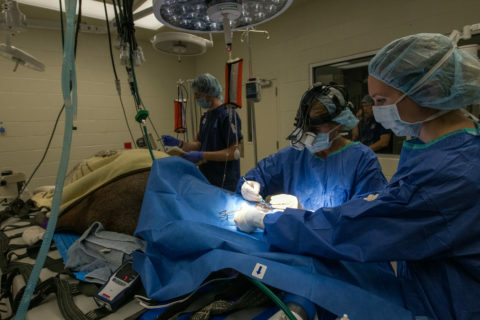 This duo, anesthesiologist Dr. James Bailey and ophthalmologist Dr. Carmen Colitz recently spent time at the Houston Zoo working with the zoo’s veterinary and sea lion teams to remove cataracts from Jonah’s eyes. Jonah isn’t your typical patient, he’s a more than 400-pound, nearly 22-year-old senior California sea lion. While cataracts are a very common issue for older sea lions for the same reasons as humans—prolonged exposure to sunlight, genetics—being able to see his trainers and the world around him is important to Jonah’s welfare. After initially diagnosed, the zoo kept close watch over his cataract development while he was awaiting surgery. During this period, the team also worked to prepare themselves and Jonah for surgery day. 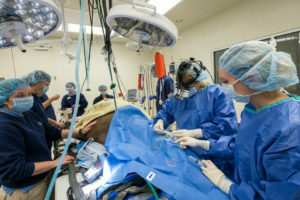 Jonah is trained to participate in his own healthcare by presenting limbs or moving onto a scale, but for this intensive surgery, Jonah needed to learn how to move into a special transport vehicle so he could get safely to the surgical suite in the Houston Zoo’s on-site veterinary hospital. During the six-hour-long procedure, Dr. Colitz performed a successful bilateral cataract removal surgery on Jonah. During the surgery, marble-sized clouded lenses were removed from each of Jonah’s eyes to improve his vision. After the surgery, Jonah initially recovered at the clinic and then was transported back to the sea lion area where his keepers gave him multiple eye drops (up to 21 per eye) each day for more than six weeks. 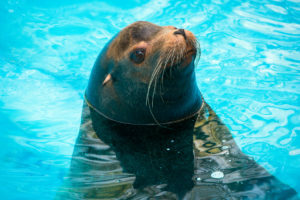 While sea lions spend time each day on land, it was imperative that while he was recovering, Jonah was “dry docked” for three weeks so his eyes could heal properly. Today, Jonah is fully recovered, and swimming and learning with the other sea lions at the zoo, including offspring TJ and Max. Guests who visit the Houston Zoo can see Jonah and the other four California sea lions in the McGovern Marine Mammal Habitat. As ambassadors for the sustainable seafood Take Action initiative, the zoo’s sea lions help guests understand that the choices they make can save animals in the wild. The zoo’s sea lions consume 23,850 pounds of responsibly-caught, sustainable fish each year. By choosing sustainable seafood options, we can all help protect our oceans’ health.